A short account of the Anarchist and Maximalist uprising in Samara in May 1918. After Moscow, Samara, a city on the Volga, was one of the strongholds of anarchism in Russia in the period just after the February Revolution. David Kogan edited the anarchist paper Chernoe Znamia ( Black Flag) in Samara in 1917-1918. Another local anarchist of importance was Alexander Moiseevich Karasik (born 1895 in the Ukraine). He had the signal honour of being excommunicated from the local synagogue for his anarchist activities and his name expunged from the list of the local Jewish community ( his brother Vladimir became a distinguished Soviet pharmacologist and toxicologist, surviving the Stalin era and dying in 1964).. In June 1917 the provincial commissar was forced to register an anarchist-communist group in Samara. Along with other political groups, the anarchists met in one of the merchants’ rooms of the Aquarium restaurant, where they established their HQ. They took an active part alongside the Bolsheviks in the October events. At the end of 1917 the Samara Federation of Anarchists (SFA) was formed, including anarchist-communists and anarcho-syndicalists. The Federation was supported by the stevedores and dockers organised in a large union and by the union of cab drivers and dray drivers as well as by many sailors of the Volga flotilla. The Federation organised the formation of combat detachments and many anarchists were in the mixed brigades of the Red Guards organised by the local Revolutionary Committee. Seizing several buildings, including municipal buildings and the mansions of the rich, the Federation had its main office at the Filimonava Hotel on the newly named Revolution Square. By the beginning of 1918 the Federation had increased its numbers considerably. Many anarchist detachments operated on the front against the White forces. In winter 1918 several of these detachments located in Samara. There was the Northern Flying Squad led by Smorodinov, the detachment led by Fedor Popov(1), the Northern Third Squad, the First Sailors’ Anarchist Detachment, etc. In mid-March, the anarchist Kudinsky arrived from Moscow with 300 combatants . In spring 1918, according to some reports, the total number of armed anarchists in Samara was a thousand. The Bolsheviks on the Executive Committee of the Gubernia wanted to send these detachments to the front at Orenburg as quickly as possible. Fired with revolutionary enthusiasm, these detachments went there willingly. The detachment led by Karasik fought bravely against the forces of Dutov. There at the front and in Buguruslan and Buzuluk counties the anarchist detachments refused the authority of the “military experts” and commissars appointed by the Bolshevik military authorities. After several engagements with the Orenburg Cossack detachments Popov and Smorodinov retreated and took up a large area in Buguruslan county. Smorodinov with 600 partisans in armoured cars occupied the town of Buguruslan. There during three months they organised an autonomous area of scores of peasant villages with a population of many thousands run on anarchist lines. Meanwhile, in spring 1918 in the city a new political force was emerging - that of the Maximalists, the far left of the Socialist Revolutionaries who had now completely broken with the parent SR party. Their ideas were close to those of the anarchists in many instances and they began both to increase in number and to form a close working relationship with the Anarchists. They waged a successful political debate with the Bolsheviks and one of their leaders, Alexander Yakovlevich Dorogoychenko (editor of the Maximalist paper Workers Republic), became the provincial commissar of agriculture, and his associate Kuz'min the Commissar of Finance and a member of the Military Collegium. The Maximalists also organised their own military detachments in Samara. The Bolsheviks were already planning the crushing of their opponents to their left. On April 6th 1918 the Bolshevik leader Ordzhonikidze and the Cheka had attacked the Anarchist Federation of Rostov on the Don and smashed it. From mid-April to early May many anarchist groups and federations in many areas, including Saratov, were attacked by the Bolsheviks. There was the major assault on the Moscow anarchists on 12th April and the attack on the Petrenko detachment to the south at Tsaritsyn at around the same time as the assault on the Samara Anarchists and Maximalists that was about to happen. On May 1st the Anarchists and the dockers held a rally with the slogan “Down with the Commissarocracy”. On the 6th May the Smorodinov detachment was disarmed by the Bolsheviks. On May 8th the Samara City Council, controlled by the Bolsheviks, began referring to the “gang of Anarchists and Maximalists” and declared them illegal. Popov was arrested that night, and his detachment disarmed. The 3rd All-Russian Congress of the Maximalists met on 10th-15th May and expressed concern about Bolshevik aggression against their groups at Izhevsk, Samara and Votkinsk. The 6th Provincial Congress of Soviets met in Samara at this time. The Bolsheviks, led by Galaktionov, demanded an increase of the tax in kind (i.e. food requisitioning). The Maximalist Dorogoychenko, on the other hand, proposed the end of the influence of political parties and the creation of a non-partisan Provincial Executive Committee. The Bolsheviks objected but the Congress has ceased to trust them. Suddenly Fyodor Popov appeared. He called for the confiscation of all food and other products and the solution to the heavy food requisitioning of the peasants of the surrounding countryside. The Congress adopted this by a majority. Dorogoychenko became head of the Provincial Executive Committee, and Kuzmin headed the Military Collegium. The City Council was still controlled by the Bolsheviks. The Provincial Executive Committee insisted that the Bolshevik-controlled City Council release all those previously arrested, re-arm the militias for the fight against the Whites, and lift the ban on the local revolutionary press. Samara was now operating independently from the Bolshevik authorities and waging its own independent war against the White army of Dutov. Meanwhile the forces of Dutov began to advance on Samara. The Bolsheviks began to panic and on May 16th issued a call for the requisitioning of all horses in Samara. This was the final straw for the citizens of Samara. The Bolshevik leadership did not consider that this had dire consequences for the Samara population with many depending on their horses for their living. In addition to the numerous cab drivers, many peasants relied on their horses for transport and for their living.On the evening of May 16th an armed Bolshevik detachment tried to requisition the horses of the cab drivers. The following morning a crowd of several hundred people gathered outside the City Council building to protest against this, gradually increasing in size and becoming increasingly angry. At midday the City Council backed down and rescinded the requisitioning. There followed a clash between the cab drivers and Red Army troops led by the Bolsheviks Augenfish and Kotylov. Firing broke out and the crowd attacked the troops. Augenfish was killed and the troops fled. More and more people, many carrying arms, began to assemble in the square and then marched through Samara chanting anti-Bolshevik slogans. The City Council building was captured by the insurgents an hour later. Officers of the Red Army passed over to the side of the insurgents and they were put in charge of some of the detachments. The fighting in the city went on all evening and night. As a result, the morning of May 18th the insurgents had seized the main Post and Telegraph office, the building of the criminal police and other police stations, as well as the prison where all prisoners, numbering two dozen, were released. 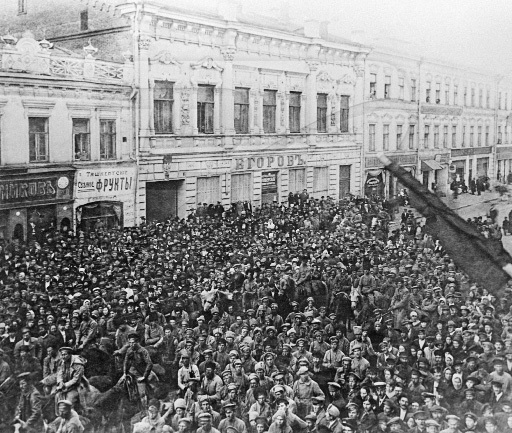 Early on May 19th Bolshevik troops stormed the anarchist centres- the Filimonova Hotel on Revolution Square where the 1st Sailors Anarchist detachment was based, the Telegin Hotel on Cathedral Street where Kudinsky and Smorodinov were barricaded in, and the City Council building, now the insurgent HQ. The following day they finally smashed the uprising. The provincial executive committee was officially dissolved by the Bolsheviks and power passed into the hands of a Revolutionary Committee led by the Bolshevik Kuibyshev (Samara was renamed Kuibyshev between 1935 and 1990). According to incomplete data, several hundred active participants in the uprising were shot, but the archives have not yet become public. On the 5th June 150 combatants of the Anarchist Flying Squad attacked Samara prison and freed 470 prisoners there on the eve of the capture of Samara by the Czechoslovak troops. In the shootout with prison guards one of the leading militants of the Samara Anarchist Federation, Alekseev, imprisoned after the events, was killed (2). After the events Dorogoychenko moved to Moscow and carried on Maximalist activity there. He later became an Anarchist and according to security sources returned to Samara where in 1923 he set up a branch of the Anarchist Black Cross. His later fate is unknown. Karasik was arrested in 1919 and put in a concentration camp until the end of the Civil War. He appears to have then gone to Moscow where he was again arrested in 1921 and sentenced the following year as a member of an underground anarchist organisation for which he received a sentence of 3 years. His later fate is unknown. He was rehabilitated by the Moscow Prosecutor’s Office in 1997. (1) Born in 1897, Fedor Dmitrievich Popov was an anarchist communist. Since December 1917 Popov commanded a large detachment of Samara anarchists. After the disarmament of the Popov detachment by the Bolsheviks in May 1918, Popov himself experienced constant harassment, and arrests. He was shot on March 7th 1938 at Magadan in the Russian Far East. (2) A.A. Alekseev, an anarchist since tsarist times, a delegate to the All-Russian Congresses of the Soviets and an organiser of the metalworkers union.. I've just added some biographical information about the anarchist Fedor Popov, a leading light in the Samara events.